On June 1st I will fly to Whitehorse, Yukon Territory and start a thrupaddle of the Yukon River together with my Swiss paddling partner Adrian. The Yukon is 3,120 km long and the fifth longest river in North America. It usually takes about 60 to 80 days to thrupaddle it. I will fly back on August 23rd. Even after all my adventures in the last 4 years this expedition is something very special for me - out of various reasons. This is my first long paddling trip. I have paddled 2 weeks in the Boundary Waters Canoe Area in Minnesota and the Everglades in Florida - but I have never been on such a long paddling trip. Luckily the Yukon is quite an easy river with no real white water and hopefully even paddling rookies like Adrian and I will be able to manage it. This is my first long trip I have planned with a partner. Almost all my other adventures have been solo trips or I have met partners while travelling, but this time I am setting out with someone. I must admit that Adrian has done most of the planning. The whole trip has been his idea and is his birthday present for his 60th birthday. I have only joined him half a year ago, but we have been a good team ever since. On this trip we will literally be in the same boat for 2,5 months and I hope we will still be talking with each other at the end of the trip. This is a relatively expensive trip. The air fare has been relatively expensive especially since I am only staying for less than 3 months. I have bought a lot of new equipment for this trip, like a new petrol stove, a two person pot set, a bugshirt, a synthetic quilt. And I will have to buy more gear in Canada like a life jacket, paddles and waterproof containers. Plus we will have to buy the boat, a Canadian canoe and many other little items in Whitehorse. We will sell the boat and the paddles at the end of the trip, but keep the rest. Although I will be able to use most of the new gear on other paddling and cycling trips, this has been a major investment for me. The Yukon poses a lot of new challenges - and a lot of them are quite new to me. Still, I would be much more nervous about this trip if I were on my own. Having a paddling partner is a big help, especially since Adrian is an experienced long-distance hiker like me. The average water temperature of the Yukon even in summer is only 5,5 Celsius. When you fall into water that cold you have about 10 to 15 minutes to get out - after that you will die of hypothermia. Remembering that we managed to capsize our boat even in the tame Everglades this is a scary prospect. The Yukon is extremely silty. If you want to get drinking water out of the river you have to let it sit overnight so that the sediments can settle down. This fine sand is also a killer of tent zippers and fabrics. I don't expect that much of our daily gear will survive intact. Wind is a big problem especially in the Yukon delta close to the Bering Sea where there are no trees left as wind breaks. These high winds can create standing waves that make paddling impossible, especially in a canoe. We are expecting to be stuck in our tents for a couple of days and I have brought playing cards to keep us entertained. We hope we have enough time buffer for these occasions. And there are the bears - black and brown. Adrian has even bought a bear proof fence for them to ensure us a good rest at night. The Yukon is very isolated. Once past Dawson City we will have very few resupply and communication possibilities. Probably there won't be many blog updates for that reason. We can just hope that we don't run into any medical problems and don't miscalculate our food supply. The Yukon is a big test for me. I want to do more paddling on my own but don't feel experienced enough for long solo trips. If I can cope on the Yukon with Adrian, I will hopefully be able to cope on my own. And then the first solo paddling adventure would be the Murray River in Australia...This is how one trip leads to the next one! 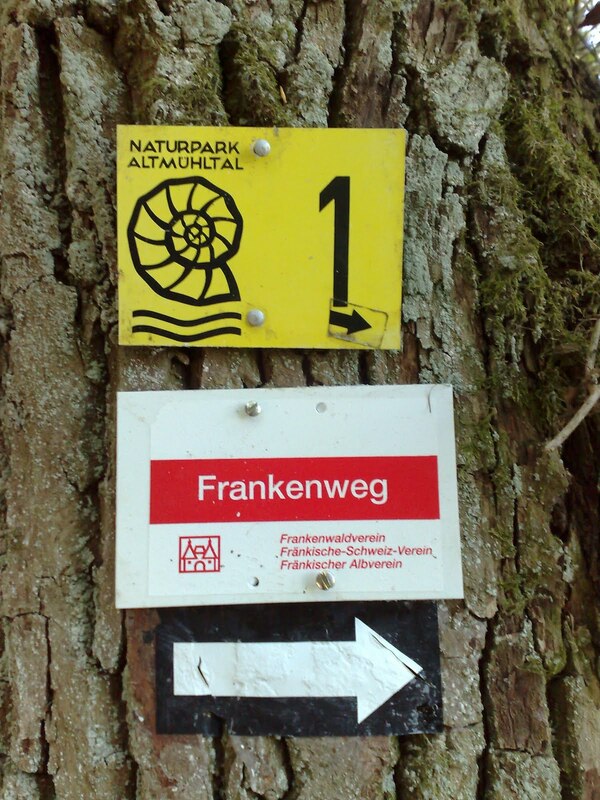 Here are some tipps and tricks for hiking in Germany - especially for my non-European readers. Water: Getting drinking water is an important issue no matter where you hike. Because you are almost always close to agricultural areas, I try to avoid drinking surface water due to agricultural run-off. But there are many other ways of getting good drinking water: If you see water coming out of a tap and NO sign saying that it is not potable, you can drink it without any treatment. This applies to springs out in nature as well as to fountains in villages. On my hike I found a lot of those springs and fountains and they are generally marked on a map. If you cannot find a natural source you have get tap water from villages or farm houses on the way. Of course you can just ask people and they will generally fill your water bottles happily. But I always try to avoid this strategy in order not to attract too much attention especially later in the afternoon when I will soon start to look for a stealth camp site. Your best choice then is a cemetery!!! German graves are usually adorned with living plants that have to be watered - and therefore almost all German cemetaries will provide tap water. Recharging your electrical devices: On this hike I had the ambition to free camp almost all the time. But that led to the question where to recharge my cell phone and MP3 player. 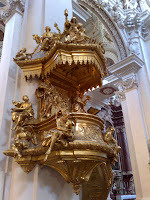 When visiting a museum or castle I would usually recharge it there, but the easier choice is churches! 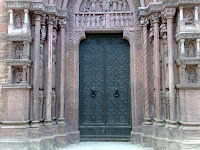 German churches are usually open during day time and have electrical sockets. Therefore I tried being in a village for lunch time where I would look for the church, plug in my cell phone and while it is recharging I am having lunch outside. In many cases the local graveyard is just outside the church and this provides easy access to water. Hygiene: Even as a long-distance hiker you should wash yourself once in a while... in more remote areas you can just swim in a lake or river, but on this hike this proved to be difficult - because either there is no lake or it is too cold or there are too many people around. But being so close to civilisation had its advantages here: Spas are very popular in Germany and I hiked through a lot of towns that had one. Although this a rather expensive luxury (expect to pay around 10 - 15 EUR) it feels heavenly to sit and relax in a jacuzzi or a sauna and get spanking clean. 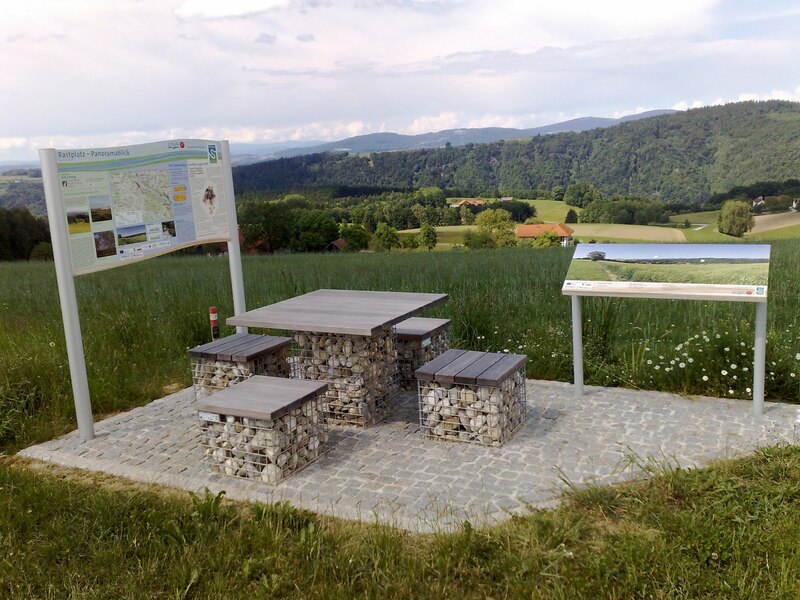 Shelters: You will find lots of benches along German hiking trails, some even with picnic tables and trash cans. 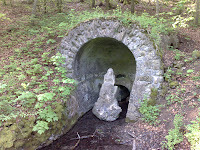 On very popular trail you will even find covered shelters although those were pretty rare on this hike. The perfect solution for finding shelter in rainy weather is raised blinds! 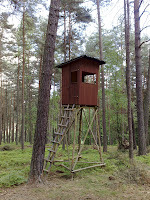 Almost all German forest is commerically used and hunting is one of these uses. 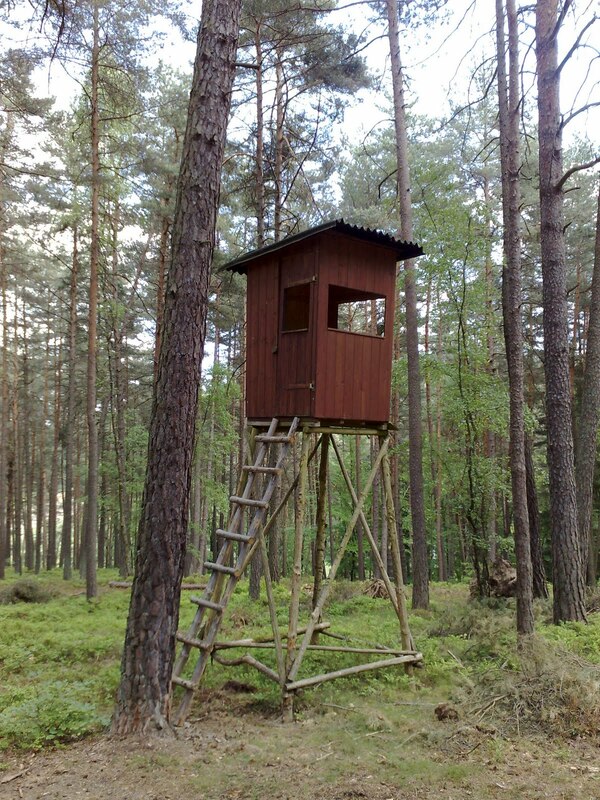 Therefore you will find hundreds of raised blinds ranging from simple seats to completely covered cabins. Although some of these constructions look (and feel!) 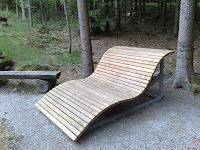 rather shaky they provide perfect shelter and seating in rain. The answer to my typical question at the end of a hike is easy this time. Would I recommend this hike to a friend? Yes, definitely and without any reservations. This has been a fantastic hike. 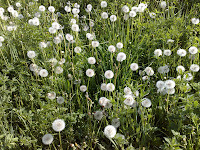 The only negative aspects have been ticks and the resulting health problems. But other than that this has been the perfect hike for Germany - and it has helped of course that the weather has cooperated. In 5 weeks it has only rained twice and the temperature has been very warm, almost hot for German standards. But especially for non-European readers I want to elaborate a bit more about trail conditions. When hiking in Germany you will not find any pristine wilderness. If this is what you are after, don't come to Germany or any other Central / Western European country. This is a very populated region and almost every piece of land is commercially used in some sense. 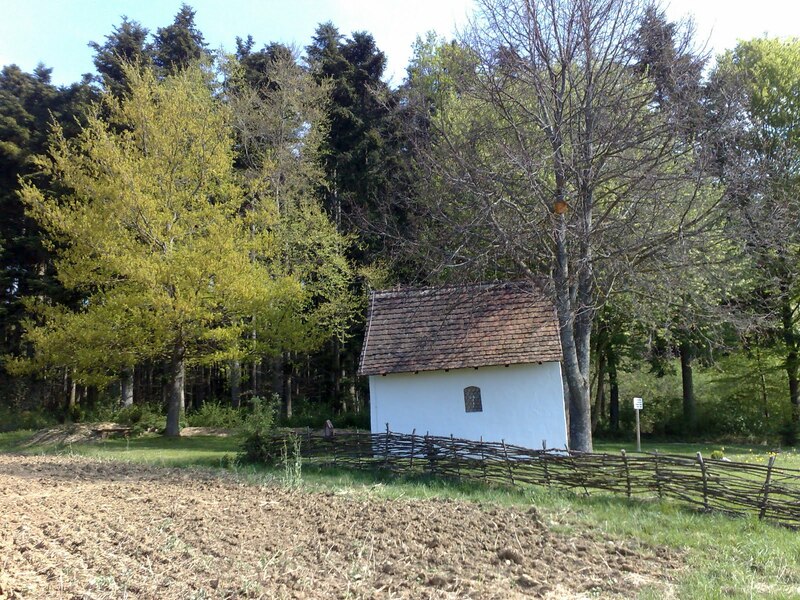 But whereas 25% of Germany consists of built up areas, 31% of the surface of Germany is forested! (By the way: that makes wild or stealth camping in Germany relatively easy..... ). But almost all of these forested areas are commercially used. And as a farmer and forest owner told me: "A forest is useless without forest roads." 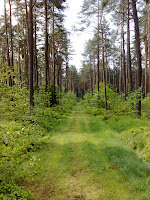 Therefore German forest is crisscrossed by a multitude of forest roads - and this is what you will mostly be hiking on. Almost none of these forest roads are paved and only a small part are wide "forest highways". You will not very often see a car driving on these roads. If you see a vehicle it will either be a farmer on a tractor "making wood" or a hunter or forrester. 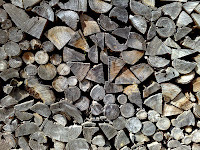 Logging mostly takes place in winter and in spring time farmers are collecting and storing the harvested wood. Unfortunately these activities can lead the horrible trail conditions, especially in rainy weather. 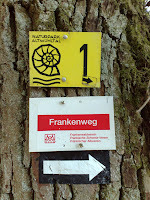 Keep in mind that there is very little purpose built single-file hiking trails in Germany. The percentage of trail surface on my hike has probably been about 15% - 20% pavement, 15% - 20% single file trail and the rest is forest or farm road of some kind which can vary from wide forest highway to very old, overgrown and abandoned logging track or tracks along meadows and fields used by tractors. The good news is that if there is a trail / track / road you can almost always use it. It is not like in the US where many trails are fenced off and entry is prohibited because they are on private property. Therefore you have almost endless hiking possibilities in Germany. Reading trailjournals of Americans hiking in Europe I realised that most of them are very reluctant to wild camp. Most end up in hotels/hostels/B&B or commercial campgrounds. I guess the reason is that they are afraid because they do not know or understand the legal situation. In Germany the legal situation for wild camping varies from state to state and the kind of property you are on. 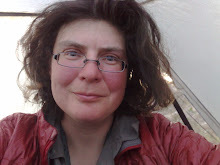 But generally you can assume that in strict legal terms wild camping would be prohibited in most cases. And the average German hiker on a 2 week holiday will not wild camp. But on the other hand "resting" is always allowed.... Wild camping is a huge topic in all European outdoor forums and bottom line is that most dedicated hikers practice it. And you will most probably not run into any problems as long as you practice some basic rules like not building a fire, not leaving trash, not camping in protected areas like nature reserves and generally being very discreet and staying out of sight. Obeying these rules you will probably even get away when caught by the land owner or forrester. But you might wonder why you should hike in a country like Germany that has so little pristine nature attractions. Well, there are a lot of cultural attractions. The trails you are hiking on have generally already been used for a long time. 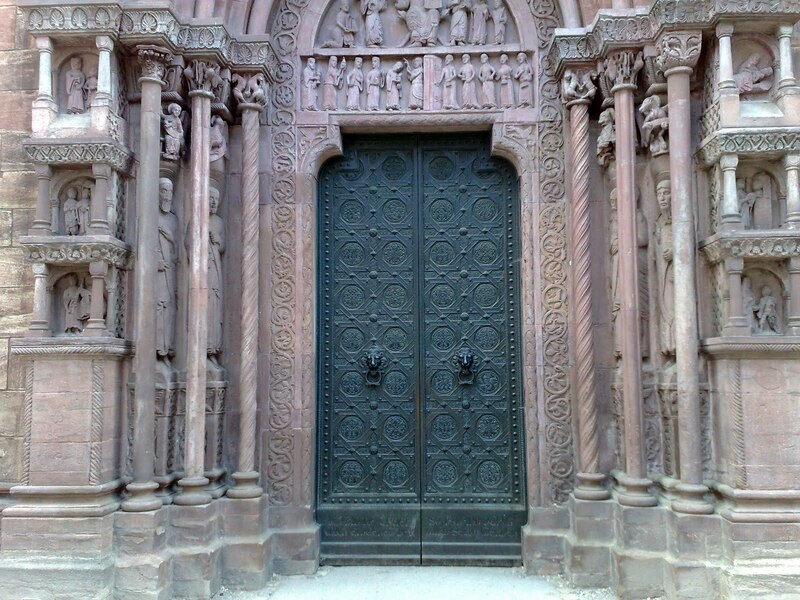 And these centuries have left their traces. You will see all sorts of memorials, chapels, stations of the cross, mark stones, statues, cemeteries and so on along the trail... 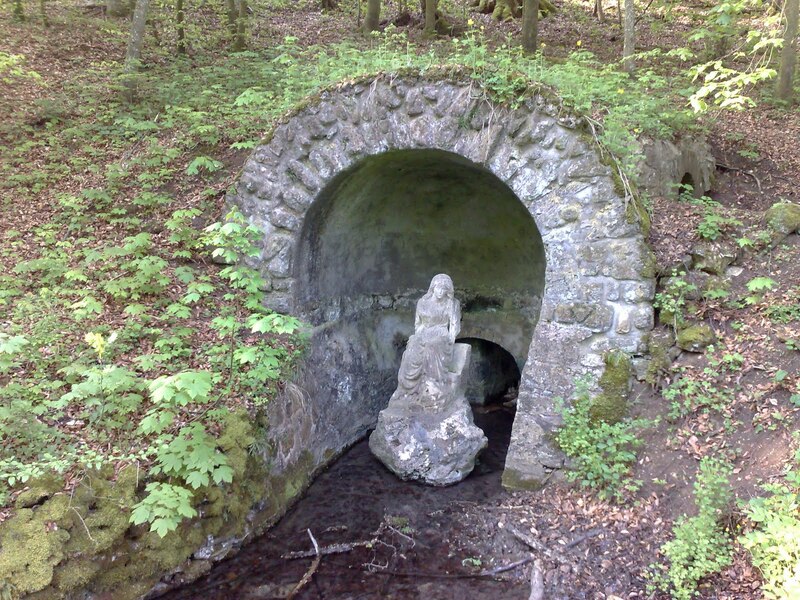 Hiking in Germany is always a walk through history, too and I find that extremely fascinating. Plus you have the opportunity to do a lot of sightseeing on the side as you come across some medieval castle (in ruins or intact), pilgrimage church or open air museum almost every day. 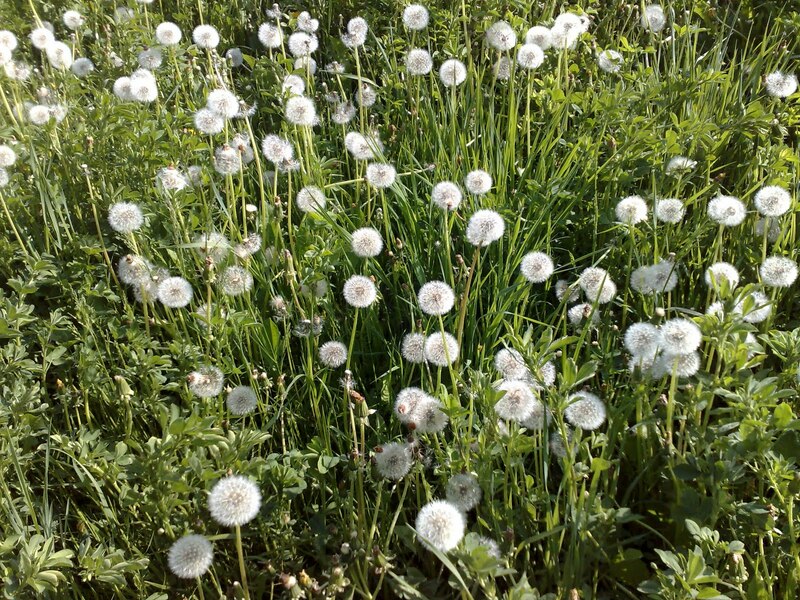 On each hike I learn something new. 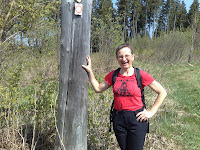 I really enjoyed this hike and I am looking forward to do some more hiking in Europe. But I also do not want to miss the wildernesses of the US or the different ecosystems of Australia. Each continent is different - and I love hiking in all of them!!! 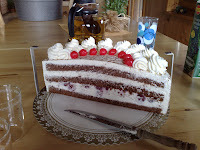 I usually hike about 1,000 km per month - and this had brought me from Waldshut-Tiengen on the Swiss / German border to Passau on the Austrian / German border. The route I had chosen was 1,000 km long and it took me exactly 1 month including 1,5 rest days. 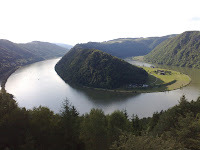 I still had 5 days left before I wanted to visit my friend Sabine and therefore I continued from Passau onward along the Danube on the newly opened Donausteig (Danube trail). The Donausteig follows the river Danube on both banks from Passau through Linz on to Grein in more than 400 km. I guess that the creators of the Donausteig have been inspired by the success of the Danube bike trail that is cycled by 437,000 bike tourists per year!!!!! I had cycled the Danube bike trail in 2008 where I already observed an incredible amount of fellow cyclists but this year was even worse. 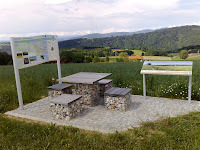 As the Donausteig and the bike trail coincide for some short distances I could watch a constant stream of cyclists - whereas I did not see a single fellow hiker on the Donausteig!!! The biggest problem of the Donausteig is the trail surface which varies wildly. There are almost wilderness sections with small overgrown and steep trails, there are trails directly along the river that were used by horses pulling ships upriver against the current - but there is also a lot of walking on pavement. About 1/3 of the Donausteig are on pavement and this is the highest percentage of my whole hike. None of the paved sections is along busy highways but still they are very bad for your feet. 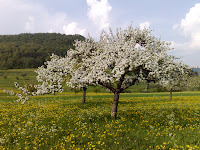 The hike ended for me in Linz which I had already liked when I stayed here on my European bike trip in 2008. 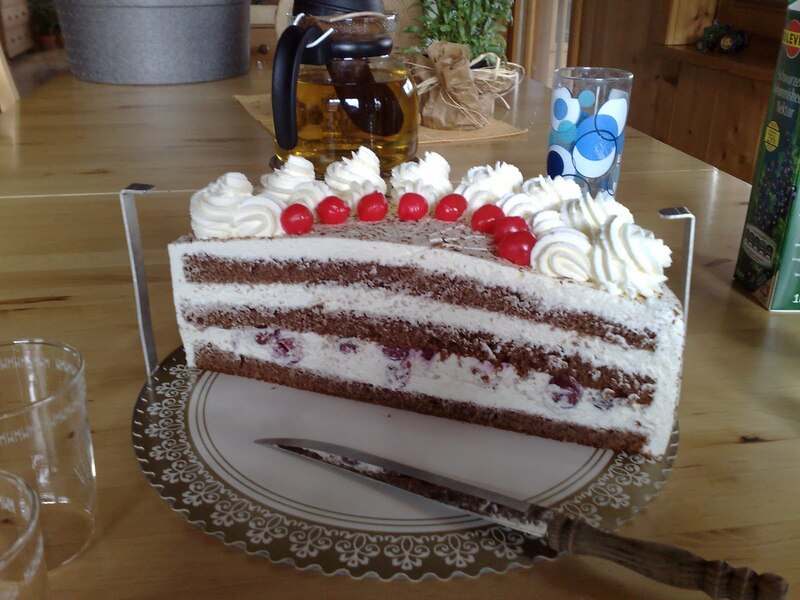 This time I opted for couchsurfing and had one of the most interesting couchsurfing experiences: I chose my host because he had studied mathematics and theology - a fascinating combination that led to hour long philosophical discussions. 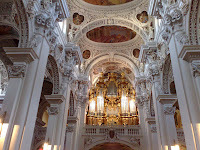 I was so intrigued that I almost did not want to leave for sightseeing, but I found a good compromise: I asked my theologist host to go church sight seeing with me - not the typical tourist churches, but weird or interesting churches and that idea turned out to be a great success. We visited an ultra-modern factory chapel at Voest Alpine, a former fabric workshop turned church with the former smoke stake as church tower and of course Linz cathedral. 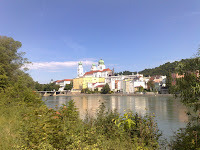 Intellectually recharged I embarked onto the last station of my trip and took the train to Krems and my UL hiking friend Sabine. We spent two days talking trail and UL equipment. She showed me all her tarps and even let me paddle around in her new packraft which will probably be the piece of equipment on my wish list.... but that is another story. And finally, after 1,150 km of hiking and 5 weeks on the trail I flew back to Berlin where I have now 4 days to pack and prepare for my Yukon adventure. The Goldsteig consists of two branches: The Northern branch traverses the crest of the Bavarian forest parallel to the German / Czech border and I had hiked that section already in 2008 - albeit in much worse weather. So this time I opted for the Southern branch which stays a bit lower. 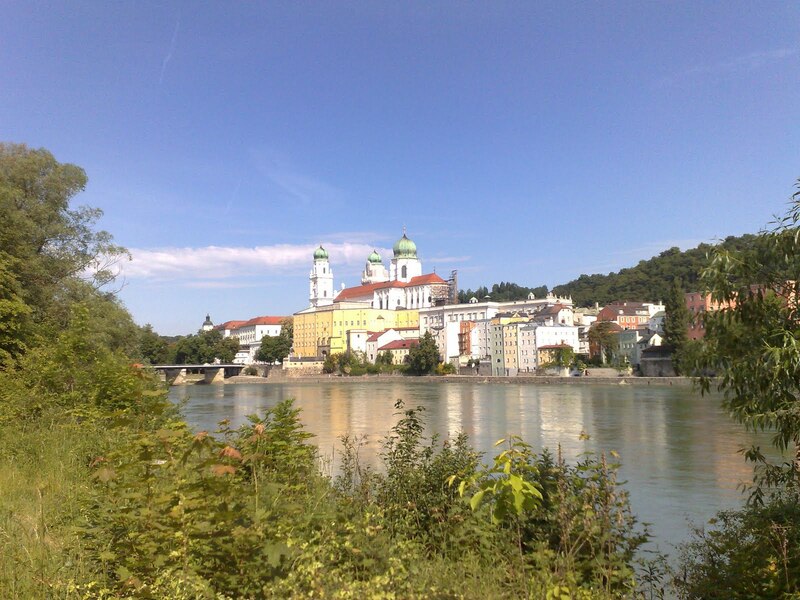 Both branches end in Passau. The Southern Branch turned out to be another positive surprise: Although it traveses a very nice and heavily forested landscape there are hardly any tourists - which is a stark contrast to the Northern branch, which is a major German holiday destination. 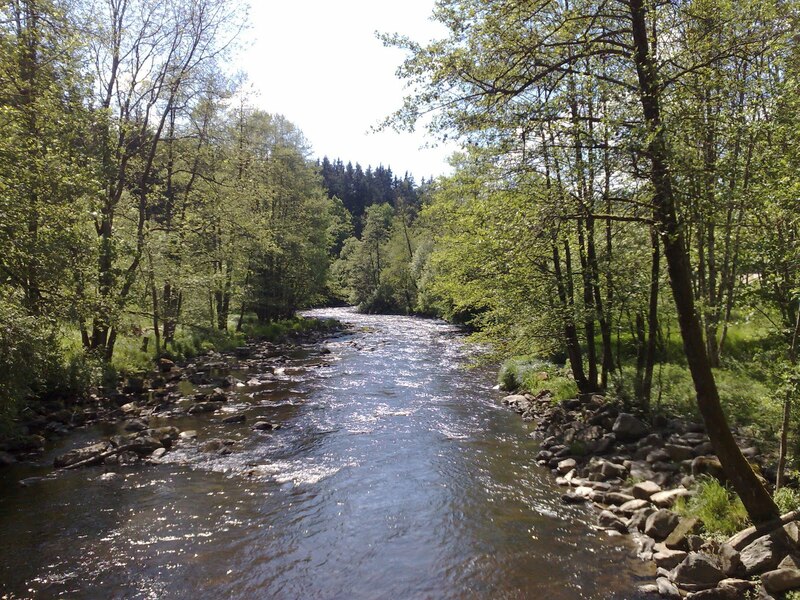 The two major nature highlights along the Southern branch are the Hoellbachtal, a "wilderness" creek valley (well, as much wilderness as you will get in Germany) and the valley of the Ilz. 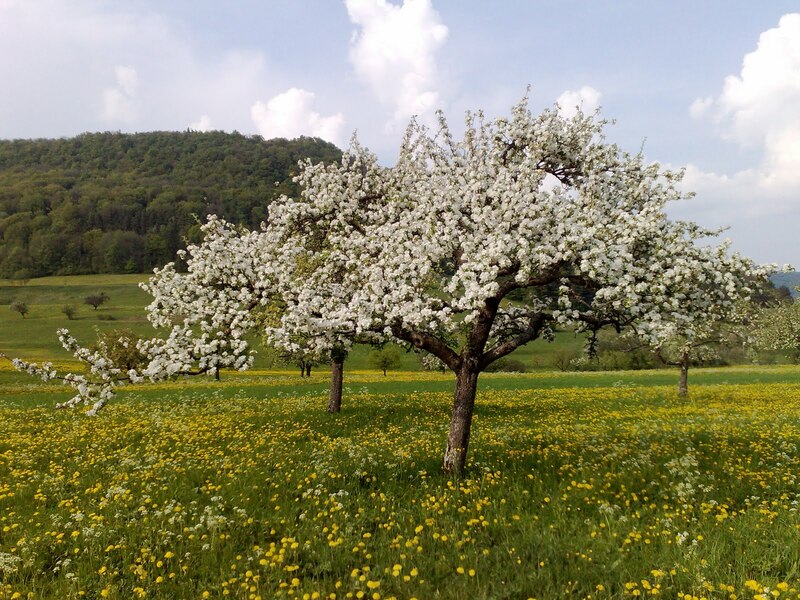 Especially Ilz valley which you follow for almost a day is very pretty: No roads are along the valley, only an abandonded railway line and literally 100s of joggers as this area is already very close to Passau. 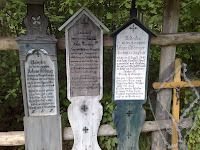 Another interesting cultural thing can be seen along the trail: Totenbretter (Boards for the dead). 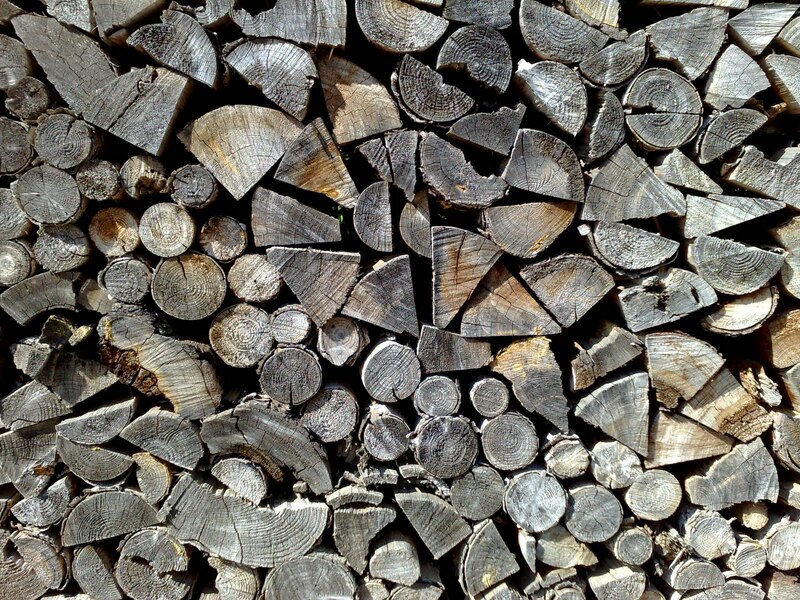 In former times the dead were laid out on wooden boards before their burial. 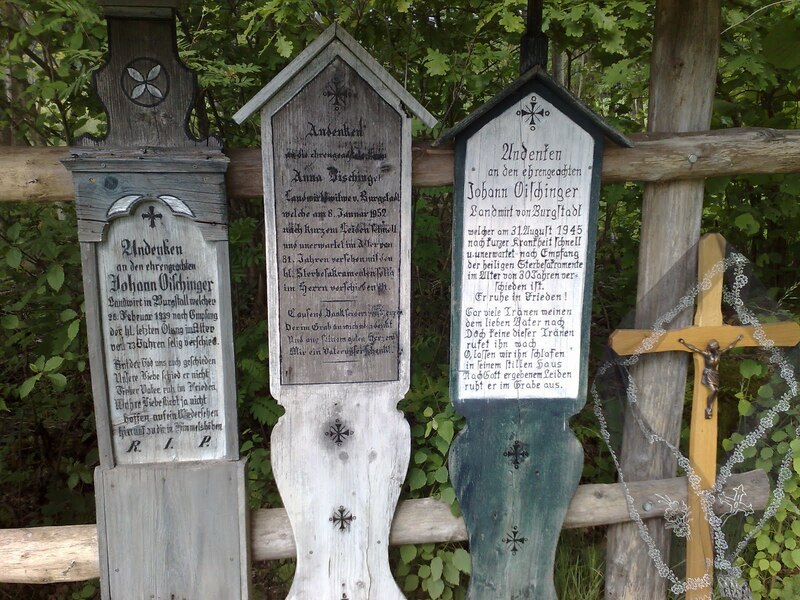 In this region of Germany the boards were not buried with the dead but erected as a memorial for the deceased. To my big surprise this is still a living tradition as many of the boards I saw dated only a couple of years back. 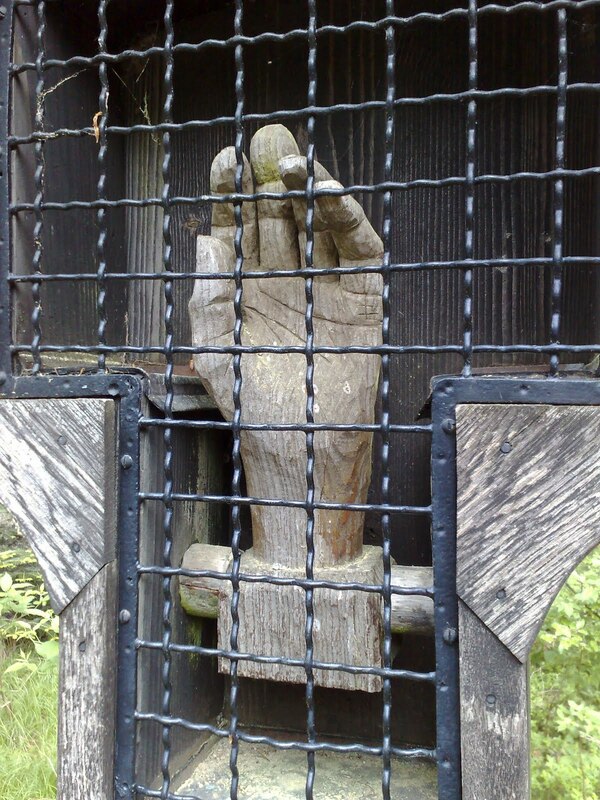 Along the trail you can also see a weird sculpture: a wooden hand! 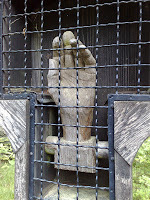 This hand was carved and donated by a regional artist who got lost in snow storm. Already afraid of dying lost in the cold a hand appeared out of heaven and pointed in the direction of the next village which he then found without any problem and was saved. 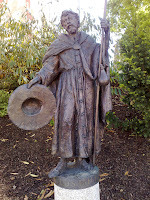 Most interesting was the amount of pilgrimage churches all along the way. 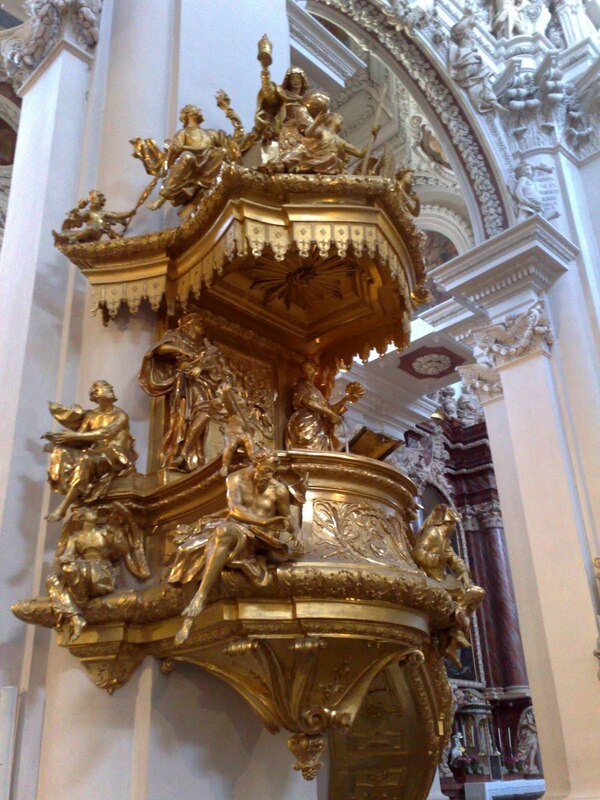 Almost every day I would come across a pilgrimage church founded because someone had had a vision of the virgin Mary, had been cured of gout or rescued from a thunderstorm. 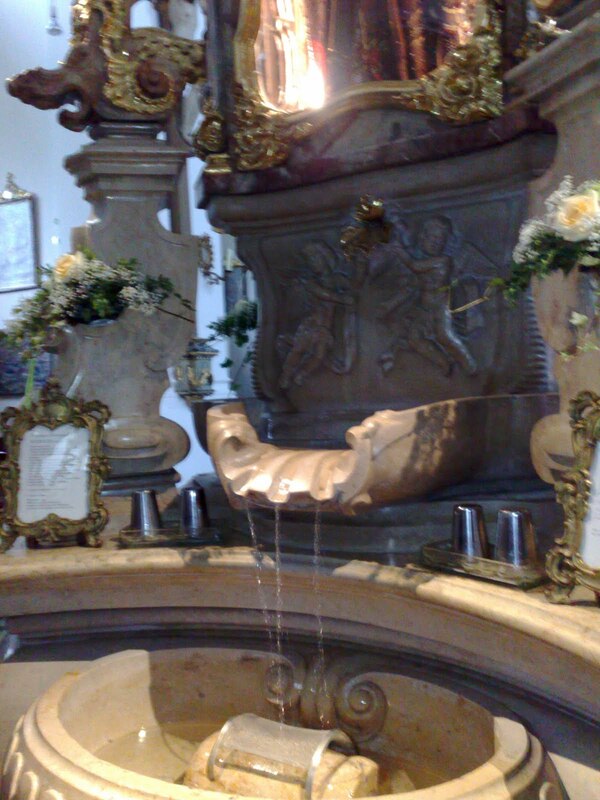 Most fascinating was "Maria Brünnlein" (Mary Fountain), that actually has a fountain inside the church and people are queuing to fill their containers with "holy" water. Even I have never had the chance to fill my water bottles inside a church! Inside the pilgrimage churches you can see a lot of "Votivtafeln": These are pictures donated by people who have been helped which describe the circumstances of the miracle. It was interesting to see how these circumstance have changed. Whereas people 200 years ago were usually rescued out of thunderstorms they nowadays survive accidents on German autobahns with Mary's help. 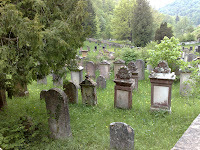 But there was much more to see than churches: I visited a Roman museum (the Frankenweg crosses the Limes, the old border of the Roman empire), a spa for a much needed general clean up, and plenty of old Jewish cemeteries. And of course there was also a culinary highlight: Bratwurst! Bratwurst in Franconia is a tiny little thing -which is very good for frying in a pan on a camping stove. The whole sausage burns within seconds and after the cooking the bottom of the pan is completely burnt. Still it is worth it as I think it tastes great - especially after a yearlong diet of American Lipton side dishes and Australian Continental pasta! 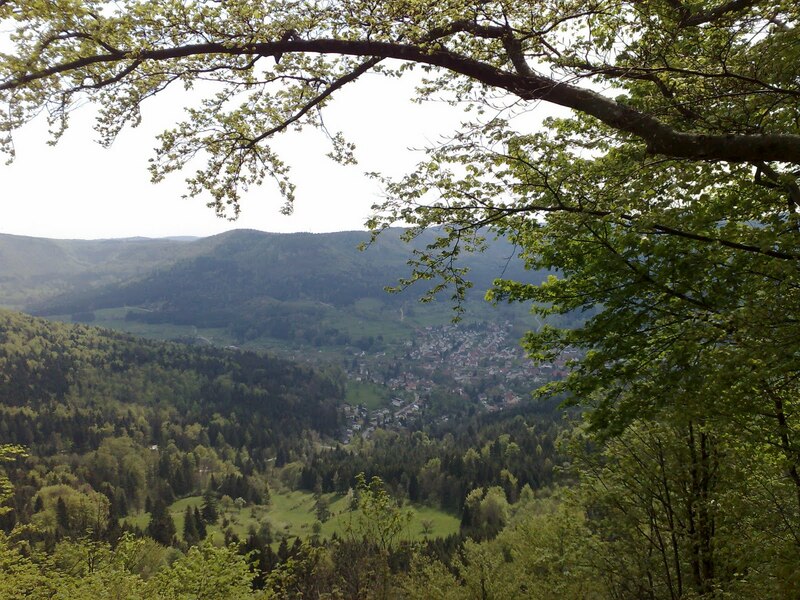 After Rottweil is was climbing up to the Schwäbische Alb (Swabian Alb) which is a 300 km long escarpment. 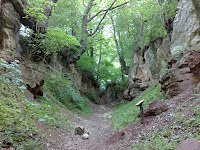 The Schwäbische Alb Nordrandweg follows this escarpment for its whole length on the Northern side, whereas there also is a similar trail on the Southern side. Although this escarpment is not pronounced all the way it is quite spectacular for most of the way. 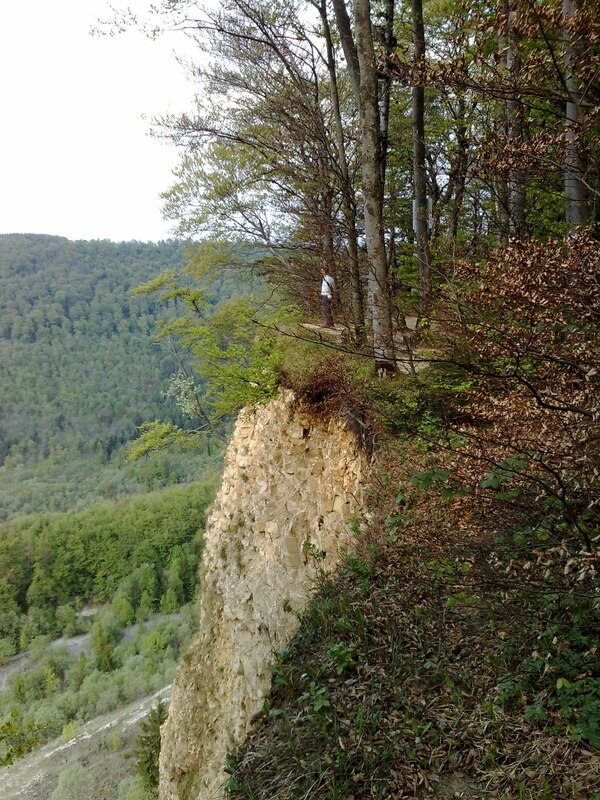 The escarpment is up to 300 m high and therefore the views are fantastic. 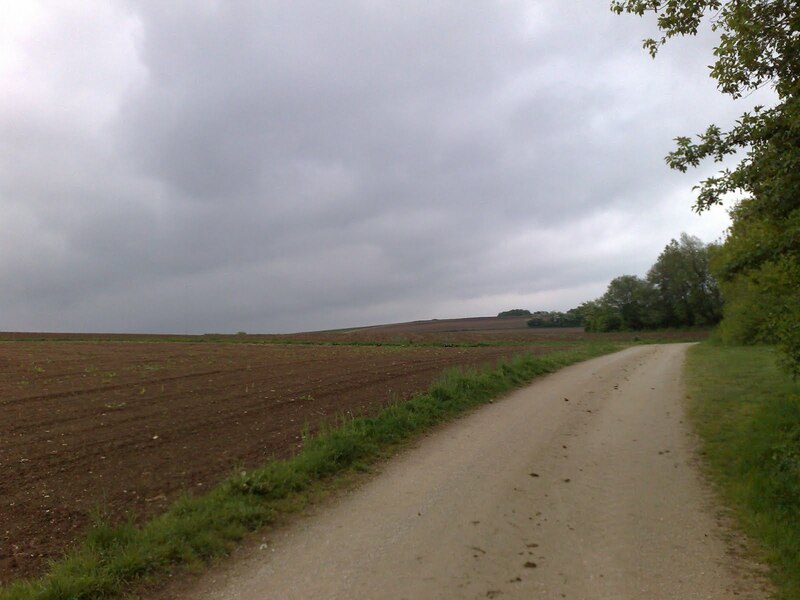 The high plateau is not very populated for German standards as the soil is very poor - but it is ideal for hiking. 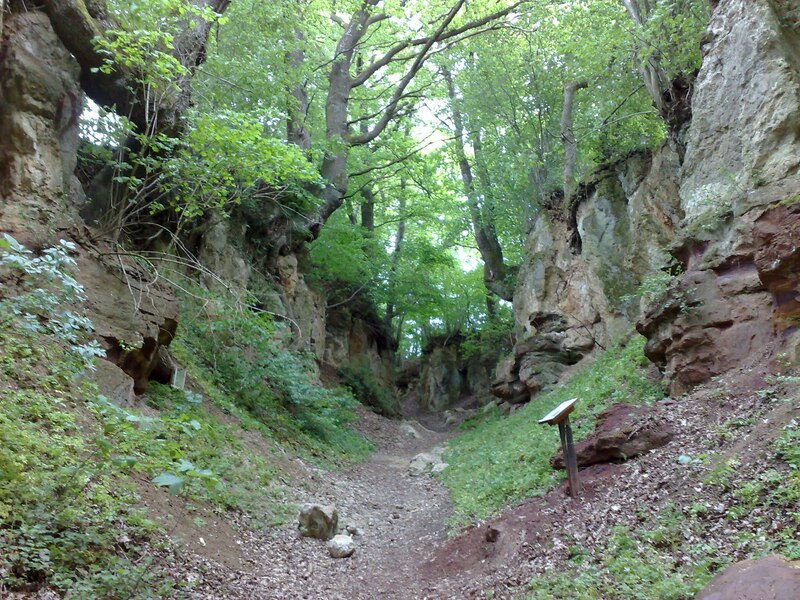 The trail itself is very old and has been created already 100 years ago. Although it is fairly well marked and there is even a specific map set and a somewhat outdated guidebook the trail is not very popular. 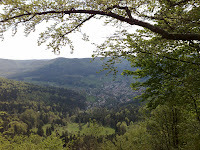 I hiked it over the Easter holidays and there were a lot of day hikers out there (this is very close to the urban centre of Stuttgart), but I did not meet a single long-distance hiker. It is a shame that this area is not more popular as it has been a real highlight. Beside the views and nature there is also a lot of cultural stuff to see. Wherever there is a mountain the Germans built a castle and therefore there was castle after castle along the escarpment. Of course most of them were mediaval castles in ruins, but some have been restored and can be visited - and some are even still lived in. 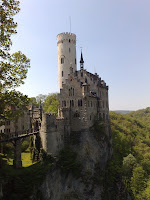 My favourite is Schloss Lichtenstein (which has nothing to do with the tiny state of Liechtenstein!). Lichtenstein had been built in the middle ages and fallen into disrepair.This castle still played a little part in the history of Wuerttemberg during the reign of Duke Ulrich von Wuerttemberg who was expelled in a civil war in the 16 th century and had to hide in a nearby flowstone cave. The cave can be visited as well and I of course did it, too. 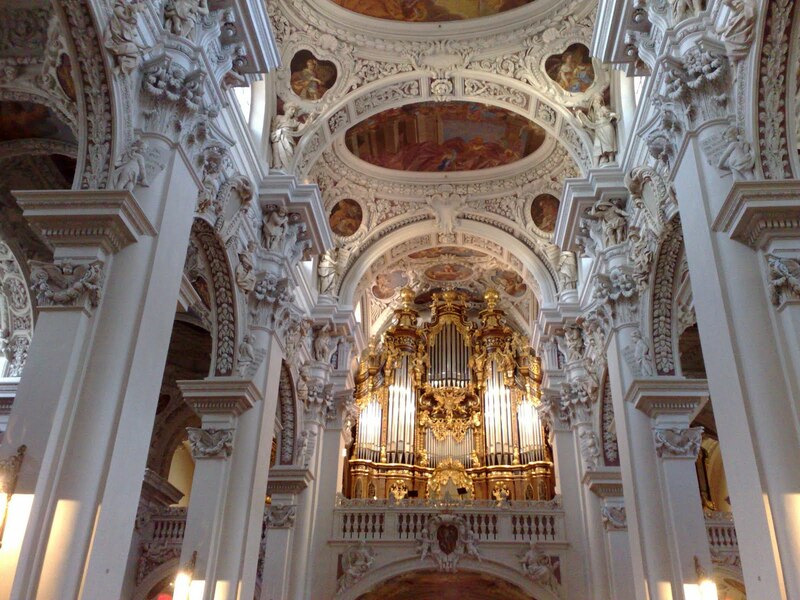 He later restored his reign and became famous for introducing protestantism into Württemberg. Three centuries later in 1826 the German author Wilhelm Hauff wrote a novel about the (in)famous Ulrich von Wuerttemberg and called the book "Lichtenstein". One of the descendants of Ulrich von Wuerttemberg was so impressed by the book that he decided to rebuild the castle in the Neo-Gothic style at its old location and call it Lichtenstein again. The castle was really rebuilt in 1842, damaged again at the end of WW II, restored again and can now be visited. Of course I did that and even bought the novel "Lichtenstein" which is now my latest reading material. Literature does have an influence! The Swabian Alb also brought another culinary highlight: Maultaschen. This is a sort of giant ravioli filled with either vegetarian or meat filling. I was told that the dish was first introduced in the middle ages when people were not allowed to eat meat on Fridays. Therefore they developped Maultaschen, were the meat is hidden inside the dough and God could not see what they were eating.... Maultaschen can nowadays be bought in any supermarket and are ideal hiker food. You just put them into boiling water, let them heat up for about 2 minutes and then they are ready to eat. 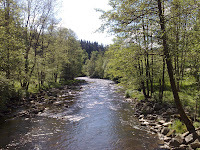 My actual hike started on Monday, April 18th when I took a train over the Swiss border to the German town of Waldshut-Tiengen in the Black Forest. The Black Forest is traversed by three long-distance trails (all about 250 km) which all start in Pforzheim in the North: The Westweg (West Trail) which ends in Basel and which I had hiked before, the Ostweg (Eastern Trail) which ends in Schaffhausen and the Mittelweg (Middle Trail) which ends in Waldshut-Tiengen and was my first stage on this trip. 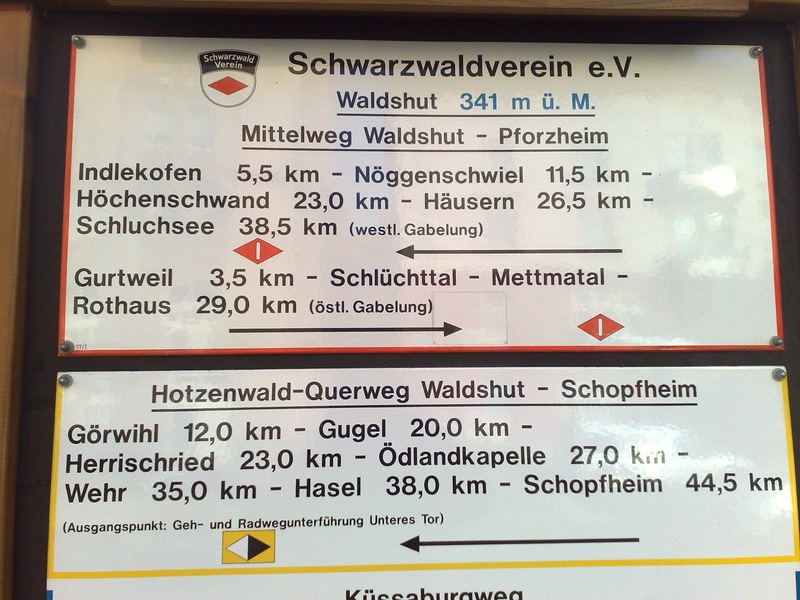 Hiking is very popular in the Black Forest and therefore I already encountered a big hiking trail sign post right out of the the train station. 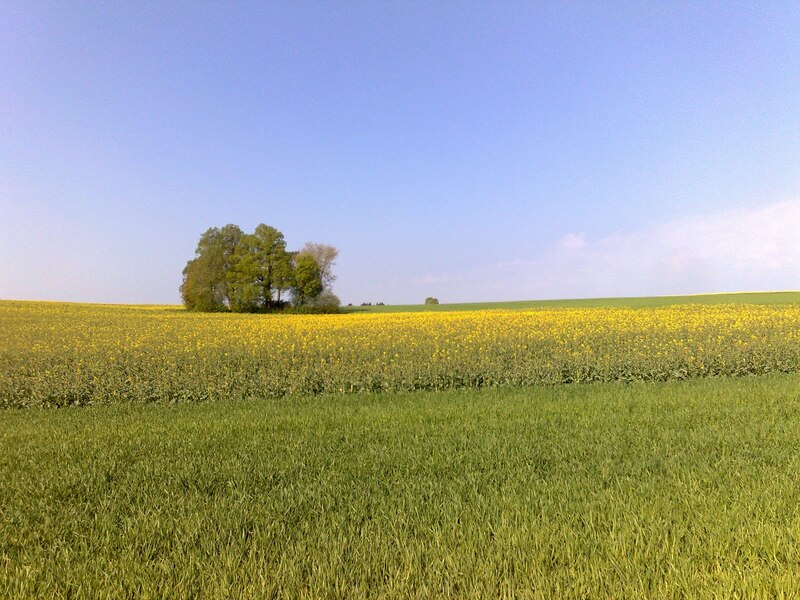 Weather was perfect: blue sky, sunshine and nice temperatures! 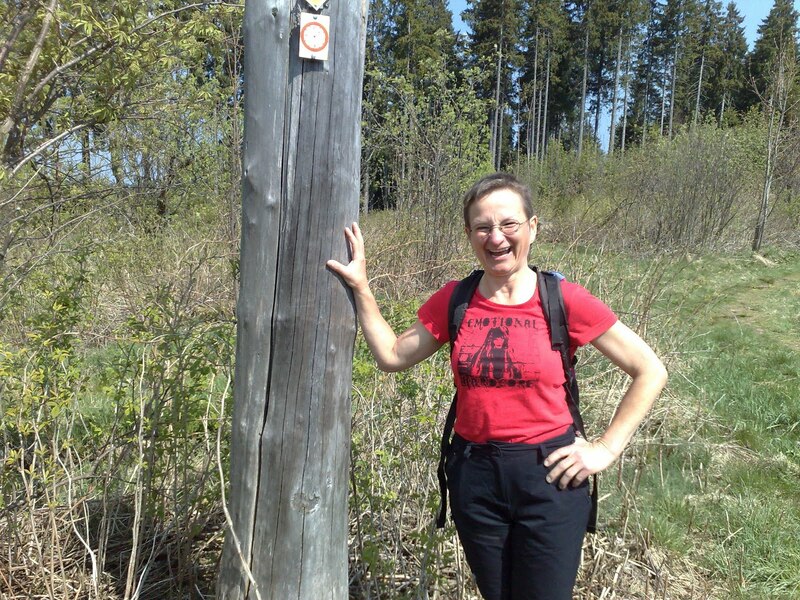 I hiked the Mittelweg three days up to St. Georgen where I met my old hiking friend Ursula. I had first met her on the PCT in 2004 where she completed her Triple Crown 4 years earlier than me. She had also paddled the Yukon River and had hiked through Great Britain before and therefore she was a great source of information for me. She is now living with her new partner in a huge farmhouse close to St. Georgen complete with a watchdog, chickens and a well. Her partner has given up farming and has leased all his farmland and sold all the animals (except the chickens). He still owns forest and was a great source of information and German forest law. I learnt that German forest owners are extremely restricted in what they can do with their property. Clear cuts are only allowed up to the tiny size of 100 m with 100 m and have to be immediately replanted. Beside that only selective logging is permitted. For hikers this is very good news: It means that if the maps shows forest, there will be forest (and good wild camping) unlike in the US where huge portions of forest can just be clear cut. My hike through Germany started actually with a planning weekend in Switzerland with my paddling partner Adrian. I flew into Euro airport Basel Mulhouse Freiburg - a very interesting airport as it is situated in the corner of three countries. 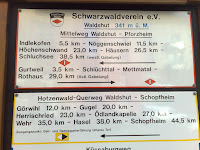 Depending on which exit you take you enter Switzerland, France or Germany. I was headed into Basel and therefore took the Swiss exit where a tram took me into Basel centre within 20 minutes. I had been to Basel before: Once when I had hiked the Westweg through the Black Forest and ended in Basel and in 2008 when I had cycled through on my bike trip through Europe. Basel is a very pretty town with plenty of museums and a spent a pleasant day strolling through town before taking the train to Adrians place. Adrian picked me up from the train station and a very efficient planning weekend started. It did not take long and outdoor equipment, gear lists and laptops were strewn all over Adrian's place. We discussed gear we need for our Yukon trip, compared gear lists and discussed resupply strategies. I had not seen Adrian in 4 years and had been wondering how we would get along - especially since we are planning to spend 2,5 months in one boat! Everything went very well, all questions were discussed and we genereally had a fantastic time. Now I am even more looking forward to our Yukon trip. But the very best were the culinary highlights: I had asked Adrian to make Raclette for me - a sort of Swiss National dish. In the modern version of Raclette you put slices of cheese on a little "shovel" and put it into a table stove to melt. When melted you put the cheese over boiled potatoes or other vegetables and eat it. Swiss cheese is absolutely delicious and the meal was fantastic, but very filling. Next day was even better because Adrian made cheese fondue. You melt cheese together with garlic and white wine in a fondue pot. You then cut bread into cubes, dip the bread into pear schnapps and then into the melted cheese and eat it. Delicious is an understatement for this dish! I usually don't drink hard liquor, but the taste of the pear schnapps (of which you use only a little glass per person) is the very best of this dish. Adrian even told me that you can buy pre-made cheese fondue mixes in Switzerland and said that he might bring one for our Yukon trip!